I am a big fan of cheesecake. Big. Huge. We had some friends over a couple of nights ago for our first Summer BBQ. Unfortunately we forgot to invite the sun, but his nemesis the clouds and rain did show up. However, we still got our BBQ on. The hot dogs and hamburgers never stood a chance. Hubby darted in and out of the house in between rounds of checking said hot dogs and hamburgers all while it was blustery outside. The good news is that even with all that wind, gloom, and rain we had prepared our own little bit of sunshine inside. Sunshine in the form of refreshingly sweet and altogether Summery Key Lime Cheesecake Bars. AND...I know it shouldn't always matter, BUT aren't they oh-so-pretty too? Do you love pretty desserts? First make the lime curd. Beat the butter and the sugar in a bowl with an electric mixer. Slowly add the eggs and the egg yolks one at a time. Pour in lime juice and mix again. The mixture will look a little curdled. Cook the mixture in a saucepan over medium until it looks smooth. Increase the heat slightly and whisk continuously until it starts to thicken. Using a cooking thermometer, continue to cook until it reaches 170 degrees. Remove the curd from the heat. Transfer the curd to a bowl and cover the curd with plastic wrap pressing it on the top to keep from the curd from getting a skin. Place in the fridge and let chill until ready to use. Next make the crust. Preheat the oven to 325. Line a 8x10 pan with parchment paper OR spray with cooking spray. Mix the crumbs and butter and then press into the bottom of the pan. Bake crust for 5 minutes and then allow to cool. To make the filling, beat cream cheese and sugar in a large bowl with mixer on medium high speed until smooth. Beat in eggs and egg whites on low speed, 1 at a time. Beat in sour cream and vanilla, then the flour just until blended. Remove 1cup of batter and reserve. Pour the rest of the batter over the crust. 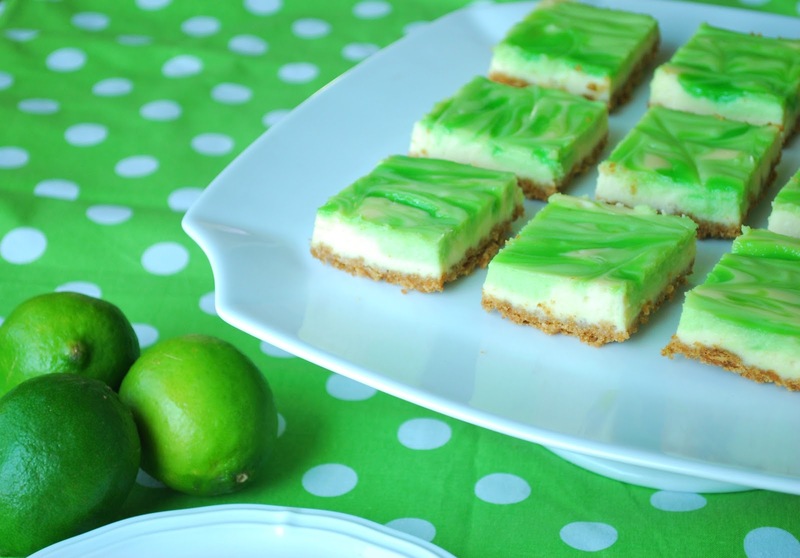 Tint the 3/4 cup of lime curd (you will have extra lime curd, go ahead a store it or heck just eat it with a spoon) with the liquid food coloring until lime-rind green. 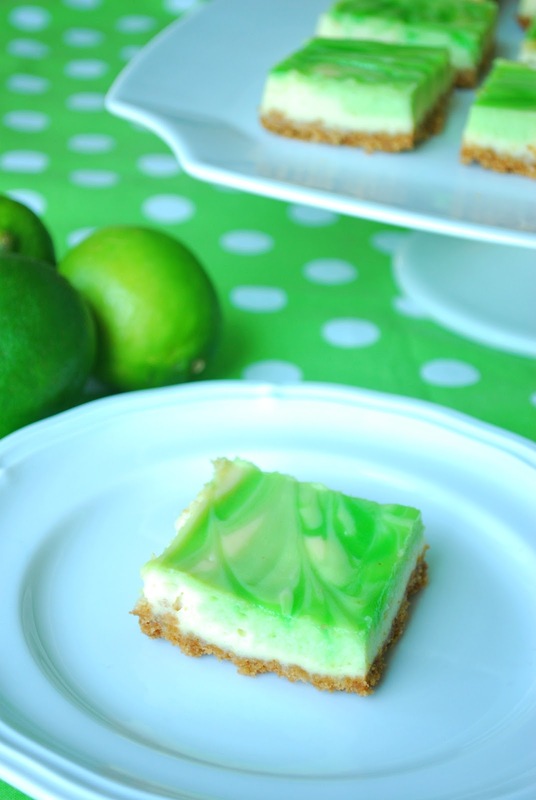 You will use a few drops of both green and yellow food coloring. Set the lime curd aside. Mix 1/2 cup of tinted lime curd with the 1 cup of reserved batter. 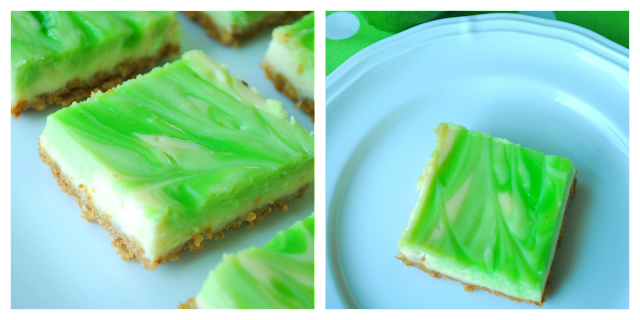 Place spoonfuls or dollops of this mixture in no particular fashion on top of the plain cheesecake batter. Dollop the remaining 1/4 cup of lime curd across the previous mixture. Use skewer to swirl the mixtures together to create a marbleized effect. Bake for 35 minutes until set. Cool completely and then refrigerate until chilled. Remove the bars from the pan with parchment over hang. Cut into bars. Serve immediately or refrigerate until ready to serve. Go on now, enjoy your Summer...no matter if it looks like Summer outside or not. Great recipe!! These will definitely be gracing my summer table. Thanks for sharing! Yeah...those look very, VERY tasty!